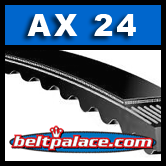 AX24 Molded Notch V-BELT. 1/2" W x 26" Length OC. (660MM) length. Notches molded into the belt during manufacturing make this belt well suited for drives with smaller diameter sheaves. REPLACES Gates 4LXP655 Belt.